CONCORD, N.C. (Jan. 23, 2019) – AdventHealth announced today that former Daytona 500 champion Jamie McMurray will run the No. 40 AdventHealth Chevrolet Camaro ZL1, in the 2019 Clash at Daytona. 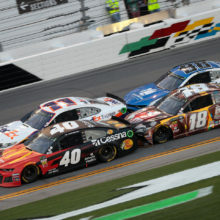 The entry, in conjunction with Spire Motorsports, is the season-opening event of 2019 at Daytona Speedweeks Presented by AdventHealth. In addition, AdventHealth and Chip Ganassi Racing also introduce the Human Innovation and Development Lab (HIDL) to focus on unique training to prepare their athletes both mentally and physically. The HIDL will be located at the Chip Ganassi Racing shop in Concord, NC. The HIDL is a human performance enhancement project that features tools and technology that the team uses to develop and improve the human performance of drivers and pit crew members. 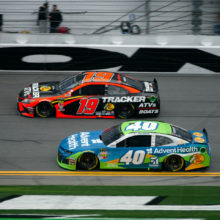 Health Coverage: AdventHealth will have a tremendous presence at Daytona International Speedway (DIS) throughout all of 2019 Speedweeks as the presenting sponsor of Daytona Speedweeks presented by AdventHealth, The program covers all of the NASCAR season-opening racing action from Feb. 8, through the 61st running of the Daytona 500 on Feb. 17. Daytona Success: McMurray has a long history of racing and winning at DIS, beginning with competition in go-karts. He has since experienced winning in nearly every type of event that he has competed in at the “World Center of Racing” including go-karts, Sports Cars and Stock cars. McMurray is one of only four drivers to have ever won the Daytona 500 and the Rolex 24 At Daytona, joining a list of racing legends that includes Mario Andretti, AJ Foyt, and Jeff Gordon. Familiar Friends: McMurray has enjoyed a partnership with AdventHealth (formerly known as Florida Hospital) for three years. AdventHealth’s recent name change unites the entire network of nearly 50 hospitals, in nearly a dozen states with a focus on whole-person care. Sharing one vision, one purpose, and one future. Jamie McMurray, Driver No. 40 AdventHealth Chevrolet Camaro ZL1: “I am looking forward to getting back in the car at Daytona and to have AdventHealth onboard with us for this race. We have had a great relationship with everyone at AdventHealth over the last several years. It means a lot to have them partner with us on this special event. 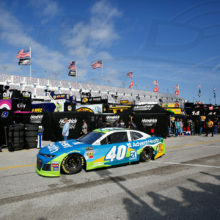 With everything that they have going on at Daytona International Speedway throughout Speedweeks, both as presenting sponsor and with their Fan Injector, I am very happy to be a part of it all”. With a sacred mission of Extending the Healing Ministry of Christ, AdventHealth is a connected system of care for every stage of life and health. More than 80,000 skilled and compassionate caregivers in physician practices, hospitals, outpatient clinics, skilled nursing facilities, home health agencies and hospice centers provide individualized, wholistic care. A shared vision, common values, focus on whole-person health and commitment to making communities healthier unify the system’s nearly 50 hospital campuses and hundreds of care sites in diverse markets throughout almost a dozen states. For more information about AdventHealth, visit AdventHealth.com, or Facebook.com/AdventHealth.